3.8 out of 5 based on 50 bloggers and 5 commenters. 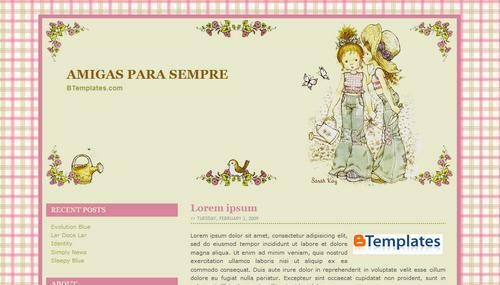 Amigas para Sempre is a free blogger template with 2 columns, left sidebar, girly looking and vintage style. Excellent template for blogs about to write a diary, kids or love. I LOVE this template! Exactly what I was looking for! Thank you so much! I love this temple!! but… can we delete the image somehow? I would like to change the main image. Can you tell me if that would be possible? You can email me at plc119 @ hot mail. Thx. Olá gostaria de usar esta imagem em meu blog. Desculpe mas não sei inglês. Gostaria que tivesse translator na página inicial, facilitaria bastante.